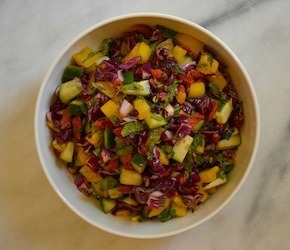 In a large bowl, make the dressing (you will be adding the ingredients to this same bowl later): Add lime juice and zest, honey, oil, salt, and ginger, and whisk with a fork until well combined. Add the rest of the prepared ingredients to the bowl, toss, and serve. Great topped with toasted nuts and seeds!